Game of Thrones continues putting the pieces on the board in preparation for the mayhem to be unleashed towards the end of the season. Like many other HBO series, Thrones isn't really for those providing a quick fix. Instead, following in the footsteps of The Wire and Rome, these early episodes are mainly concerned with establishing character and storylines in readiness for the bigger events to come. The fourth episode, Cripples, Bastards and Broken Things, is written by the show's 'lorekeeper' and script editor, Bryan Cogman. This change in voice (the first three were written by producers David Benioff and D.B. Weiss) is noticeable in that we get a lot of exposition-heavy scenes. Viserys tells Doreah about the Targaryen dragons, Tyrion taunts Theon about his people's defeat in a rebellion ten years ago and we learn that King Robert likes to fool around on the side. It's all interesting stuff, but it slows down the action and feels a little clunky. 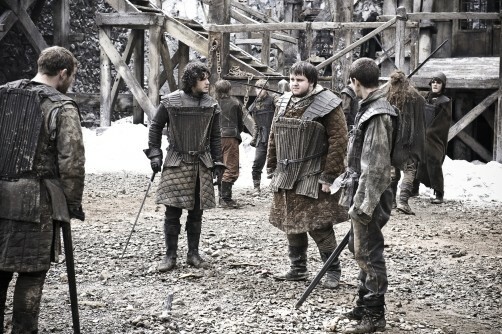 Luckily, there's no such problem at the Wall, where we get a self-contained narrative in which Jon Snow welcomes a new recruit, Samwell Tarly (excellent work by John Bradley-West), and protects him from the bullying of Ser Alliser Thorne (similarly great work by Owen Teale). This results in a terrific scene where Thorne spells out exactly what members of the Watch are expected to do and the conditions they have to live in beyond the Wall, where soft boys like Sam will die like flies when the winter comes. It's a notable scene because in the books Alliser Thorne is something of an incidental character. Not undeveloped (he has some great material in Book 2) but definitely more background than here. The TV writers have taken a leaf from GRRM's book in making both Thorne and Viserys into more ambiguous figures, still antagonistic but with more understandable motivations and backgrounds. The fourth episode thus gets points deducted for clunkiness but added for the great material at the Wall and also for the brutal tourney scene, where Conan Stevens is introduced as the imposing Ser Gregor Clegane, before finishing on a terrific high as one of the most memorable scenes in the novel - Catelyn's confrontation and 'arrest' of Tyrion at the Crossroads Inn - leaps straight from the page to the screen. It's a tribute to Peter Dinklage's acting that as much as we sympathise with Tyrion, it's also the case that he's been right about everything so far and been rather smug about it, so seeing the grin wiped off his face here is oddly satisfying. The fifth episode, The Wolf and the Lion, fires along on all cylinders. The tourney continues to unfold, resulting in a confrontation between Gregor and his brother. We also meet Loras Tyrell (Finn Jones), the Knight of the Flowers, whose arrogance in combat and easy charm with the commoners is ripped straight from the books. What appears to be different is the establishing of him in the TV series as Renly's kingmaker. Whilst not incompatible with the novels, it's something not clearly established, but it's a reasonably effective idea (especially if Mace Tyrell is behind the suggestion, as Loras's dialogue hints). Loras and Renly's relationship, which is low-key and mostly off-page in the novels, is more overtly established here, and is an effective way of establishing Renly's character (which is very different to the books, but his self-doubt and apparent reluctance to seize the throne distinguishes him from Robert and Stannis). 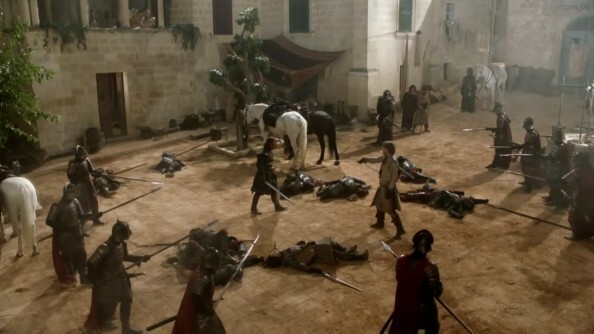 The fifth episode is also effective in dropping the Wall and Vaes Dothrak threads to focus on events in King's Landing and the Eyrie, where Tyrion is dragged before the stark-raving Lysa Arryn and her over-coddled son Robin (changed from the novels, apparently to avoid confusion with Robert and Robb) in one of the more bizarre scenes from the series to date. The Eyrie is established in just two scenes as a great castle that has become a bizarre madhouse under Lysa, which again is somewhat different from the books but is again effective. In fact, the Eyrie itself is radically different from the novels, losing the waycastles, the Gates of the Moon and the memorable ascent of the mountain. Whilst it's still an impressive design, it's one of the first times with the imagery that what we get on-screen falls disappointingly short of the books. Back in King's Landing we get a number of new scenes, but this time less concerned with establishing backstory than character. So Cersei and Robert get a disarmingly candid conversation about their relationship which is played for all its worth by both actors (Mark Addy in particular has silenced those critical of his casting to make for a memorable Robert, a mixture of bluster, humour, bitterness and frustrated rage), whilst Conleth Hill delivers several excellent performances as Varys in quick succession. Maisie Williams continues to impress the most out of the younger cast, making Arya funny and sympathetic but also admirable and slightly worryingly psychotic. But the best scene of the episode is held for last, as Sean Bean and Nikolaj Coster-Waldau do great work as Eddard and Jaime cross swords. Coster-Waldau plays Jaime to perfection as he enjoys the fight, is slightly surprised to find someone who is almost as good as him, and then gets pissed off when one of his soldiers interferes with the fight. Great stuff. The sixth episode, A Golden Crown, continues the fine work as Tyrion, after negotiating with a demented jailer, convinces the redoubtable Bronn (Jerome Flynn) to fight on his behalf. Flynn - light-years from his roles as a trooper in Soldier, Soldier or as a chart-topping easy listenin' singer - nails Bronn's greed and total lack of honour in the effectively brutal fight that results and gives us a great line: "You do not fight with honour!" "No, he did." Back in King's Landing Syrio continues training Arya and gets another brilliant line: "There is only one god and his name is Death. And there is only one thing we can say to Death: 'Not today'." At this point I would happily campaign for a Syrio spin-off series. We also get a great scene where Eddard makes a rash pronouncement in the throne room (with perhaps unnecessary commentary from Littlefinger) and later realises the truth of the secret that Jon Arryn died for. However, as the title indicates, the most momentous events are held for across the Narrow Sea. Harry Lloyd saves his best for last here as Viserys realises how powerless and unloved he is, pushing him to acts of desperation and foolishness (with more terrific work by Iain Glen as Jorah Mormont) which eventually prove terminal. The final scene is a powerful and effective restaging of a key scene from the novel. Game of Thrones is starting to really hit its stride. Moments of clunky exposition aside, the show is definitely building momentum and energy as it approaches the point in the books where all hell breaks loose. Forthcoming: You Win or You Die (29/5/11), The Pointy End (5/6/11), Baelor (12/6/11), Fire and Blood (19/6/11). Do you (or anyone else for that matter) have any idea when the series will make it to DVD? It sounds like it's really getting very good, and I'm more certain now that I want to pick up the series, when I wasn't so sure at the beginning. Also I'm glad to see that Arya is slightly psychotic, that's a good sign for sure. Great piece Wert! I'm really pleased with the adaptation so far and think the writers/directors have done everything they can to keep fans happy and attract people who have not read any of the books. 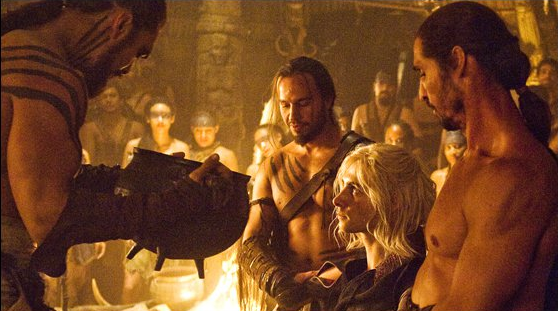 My only fly in the ointment is events across the sea, the Dothraki just are not working for me. This is probably because of budget, it's got to be hard to put 40,000 men on horseback convincingly so everything looks small scale. Can't wait for the last 4 episodes, especially looking forward to Baelor (which I believe GRRM wrote) because I'm pretty sure I know what happens then on the steps of a certain Sept.
Viserys's 'crowning' was fantastically horrible. My girlfriend (not generally a fantasy fan, apart from Harry Potter, so I'm glad she's getting into GoT) said Syrio looked like Robert Downey Jr; I think he looks like a cross between Downey and Moss from The IT Crowd. It's been a while since I read the first book - or any of the books, it's been that long since Feast - but the series seems like a very faithful reproduction. My only gripe is that some of acting - or, more specifically, some of the phrasing has been a bit wooden. For instance, there are too many overly emphasised 't's within words - it almost seems like the actors have been told not to drop their 't's. The DVDs should be out in early 2012, though there's a small chance they might be out pre-Christmas to capitalise on that market. GRRM wrote 'The Pointy End', the eighth episode. I've really enjoyed the series and agree that the Dothraki side of things hasn't been brilliant though I've really like Jorah. There are a few minor niggles (they really didn't show the passage of time in melting the gold very well) but overall I'm very happy with the series. I've seen episode 7 and it's an absolute CRACKER, so can't wait for ep 9. I'm having a viewing party this weekend with some fellow BwB and a few new to the show which should be a fun mix. 6 eps in a row all in HD - woo hoo! Might have to break out some mulled wine.